Shares of General Electric (NYSE:GE) lost nearly half of their value in 2017 as several of the company's key businesses -- most notably its power segment -- ran into trouble. GE stock then plunged more than 50% in 2018 as the downturn at GE Power worsened. However, GE shares bounced back in early 2019, rising about 40% in the first eight weeks of the year. The rally has fizzled out in April, though. Last week, GE stock plunged 10%, sparked by a big analyst downgrade. As of 2 p.m. EDT on Monday, the stock was set to move lower for a ninth consecutive trading day. GE Stock Performance, data by YCharts. Yet there hasn't been much fundamental news to drive this stock swoon. GE is certainly still in turnaround mode, but the company appears to be making the right moves now to get back on track. As a result, GE stock looks like a great buy at its current price around $9. J.P. Morgan analyst Steve Tusa has gained wide recognition in recent years after a prescient call to sell GE stock three years ago. Investors who heeded his advice were able to avoid the stock's massive plunge in 2017 and 2018. Tusa finally upgraded GE stock to a neutral rating last December, near the stock's multiyear bottom. At that point, he argued that the stock price was more reflective of the risks GE faced, although his price target of $6 remained below General Electric's share price. 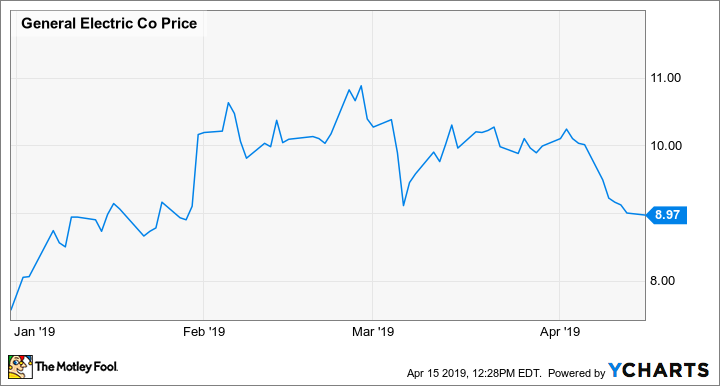 As the stock rebounded in early 2019, Tusa seemed to grow more bearish again, saying that the upward moves in GE stock weren't warranted. Last week, he finally downgraded GE to an underweight rating again -- the equivalent of sell -- and reduced his price target to $5. Investors listened, sending the stock down 5% on the day of the rating change. In justifying the downgrade, Tusa pointed to GE's stubbornly weak free cash flow and its high debt and pension liabilities. He thinks investors are overestimating the company's ability to fix these problems. One highly respected analyst thinks GE stock is set to plunge again. Image source: General Electric. Tusa deserves a lot of credit for identifying the problems at General Electric long before most investors. However, his recent criticism of the company seems less justified. For example, Tusa repeatedly warned that the company would need to raise capital by selling more GE stock, but management has found plenty of other ways to shore up the balance sheet. Most notably, General Electric struck a deal earlier this year to sell its biopharma business to Danaher for $21 billion. Between this asset sale and selling down the remainder of its stakes in Wabtec and Baker Hughes, a GE Company, GE will be able to pay down more than half of the $55 billion in net debt it had entering 2019. Many analysts expect further asset sales in the next few years. General Electric also plans to reduce its GE Capital unit's leverage, improving profitability there. Meanwhile, CEO Larry Culp expects the power and renewables units -- which are on track to burn more than $4 billion of cash this year -- to improve significantly in 2020 before returning to positive free cash flow in 2021. Indeed, much of the plunge in free cash flow expected for 2019 is being driven by temporary headwinds like legal settlements, restructuring costs, and losses on legacy projects that were not priced properly. All of those headwinds will fade substantially by 2021. The elephant in the room that Tusa only obliquely addressed in his downgrade is GE Aviation, a steadily growing segment that is GE's primary profit driver. Tusa says that the aviation business isn't as strong as it seems. The division's free cash flow totaled $4.2 billion last year, even as its reported segment profit reached $6.5 billion. Management expects segment free cash flow to be flat year over year in 2019. However, GE Aviation's free cash flow is currently being limited by the ongoing transition of its highest-volume product -- produced by its CFM joint venture -- to the new LEAP engine family. That means CFM is incurring temporarily higher production costs. A similar transition (albeit smaller in scale) to the GE9X engine for Boeing's (NYSE:BA) new 777X will begin next year. But beginning in 2021, the gap between earnings and free cash flow for the aviation segment should start to shrink. It would be reasonable for investors to wonder if the current grounding of the Boeing 737 MAX has disrupted GE Aviation's growth momentum. After all, the 737 MAX accounts for more than half of the demand for CFM's LEAP engines. But Boeing is close to submitting a fix for the issues that contributed to two fatal crashes over the past six months, which should pave the way for 737 MAX deliveries to resume a few months from now. General Electric's CFM joint venture builds the Boeing 737 MAX's engines. Image source: Boeing. Furthermore, GE Aviation gets most of its profit from services, not from selling engines to Boeing and Airbus. (Indeed, at the moment, CFM engines are being sold at a loss.) Services revenue is on track for steady growth over the next decade, driven primarily by maintenance on prior-generation engines. As a result, Boeing's production slowdown is unlikely to meaningfully impact GE Aviation's growth. With this growth driver intact and GE's balance sheet set to improve dramatically over the next year or two, the recent drop in GE stock looks like a great buying opportunity.